Not long ago, I had a discussion on Twitter regarding baked donuts. I ascertained that a baked donut is not a donut at all. More of a muffin really, than a donut. A round muffin with a hole in the middle. 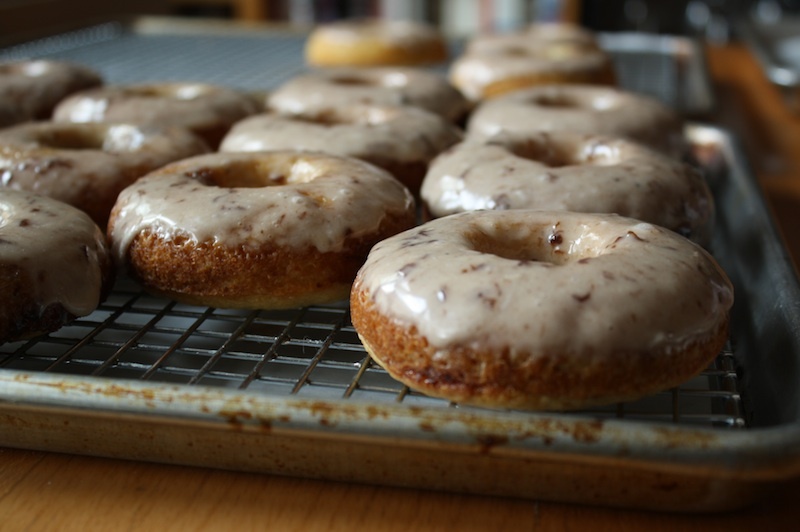 In my opinion, a donut – or doughnut – needs to be fried and I was quite adamant about it. Absolutely, no question, in my mind that skipping the deep fat is skipping a crucial step in the delicious donut process. The doughy masses greatly benefit in both flavor and texture from a little swim in some hot oil. But it got me to thinking. While I still believe a baked donut is more of a muffin, could they be as delicious as a donut? I aimed to find out. As I discovered, the answer is a bit more complicated, a mixture of yes and no. A hybrid. Which is sort of what a baked donut is anyway. And there are all sorts of complications with a baked donut. First off, you need a special pan which is 10 kinds of annoying and unless you buy a few pans, there is the added challenge of batch baking. I suppose you could use a muffin tin but then you have a muffin. Even if you call it a “donut muffin”, let’s be honest: it’s a muffin. Not a donut. While in general there are three basic types of donuts – raised, cake and fritter – with a baked donut, you’re limited to the cake variety. (note: I reserve the right to change my opinion on this point if additional research warrants). A baked donut, at least one baked in these special pans, means you can’t stuff them with a delicious filling. You could certainly pipe a filling into one baked in a muffin tin. But isn’t that just a filled muffin? And we’re back to square one. It’s all very complex. The question, as I see it, lies in what is the single defining factor that makes a donut a donut. Is there even a single defining factor or is it a combination of many? Is it the frying process? Is it the shape? Is it a textural thing? Glazes, toppings, fillings? I was leaning toward the frying but was determined to figure this out. So first up was the special baking pan which I got for Christmas, thanks to my enterprising father who spotted one on my online wish list. I’d placed it there as a sort of reminder of this idea, going back and forth as to whether I’d go forward with the project. With the choice made for me, I threw my preconceived notions to the wind and started experimenting. To complicated matters even more, and mostly because I’m nuts, I wanted to see if I could fill the suckers and bake a ring of jelly inside the “donut”, like those little Hostess gems I loved as a kid. Let’s just raise the bar a little higher, shall we? It took 5 tries to get it right and while the first batch wasn’t all together horrific, it wasn’t great. So I kept at it. In the end, I came upon the winning recipe while cleaning up the piles that had accumulated next to my couch. As I sorted through a knee-high pile of food magazines, I came across last year’s special donut issue of Saveur. Within, there was a recipe from the LA bakery Fonuts. Of course. If anyone knew how to master this it was a bakery specializing in baked donuts. Of course. Bingo. With a few tweaks I have to say, they were pretty delicious. I sort of didn’t want them to be, but they were. I filled the molds about 1/3 of the way, piped in a ring of jam and piped additional batter on top to cover. 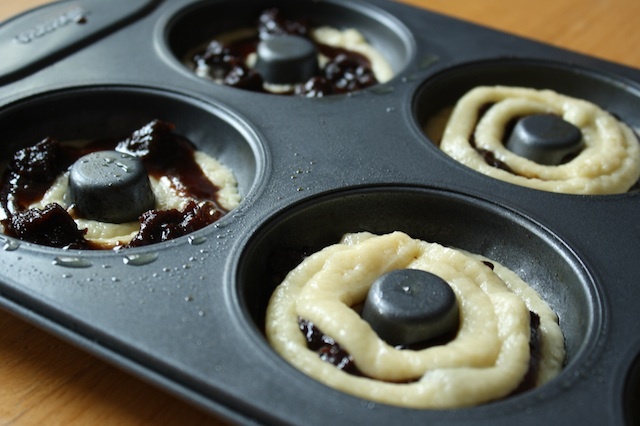 Due to the baking molds, they’ll always look a little flat and squatty but the key is to fill them full enough so they puff up but don’t cover the hole in the center of the pans. Remember a baked donut needs that hole, otherwise it’s just a muffin. The most unexpected bonus? Unlike most baked goods, they’re actually better the next day. What the what? The jam center and glaze helps keep them very moist and I think they might actually benefit from a little time. That’s a new one and rather convenient too – no more baking in the wee hours to bring something fresh to work or school. So while I’m fairly confident after my experiments that yes indeed, a donut needs to be fried to be a true donut, the fact that there is no leftover fryer oil to deal with makes these very appealing. They won’t replace my love for a good old fashioned or a deliciously squishy Boston creme, but I might be seeing these around now and again. STRESS THERAPY BAKING FACTOR: PRETTY DAMN GOOD. 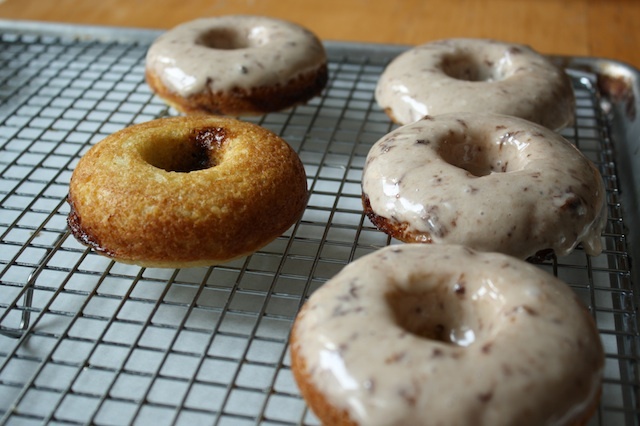 A baked version will never take the place of a tried and true fried donut; I may be willing to admit there’s room for both in one’s baking repertoire. While by no means low fat, they are a lot easier than they’re fried counterparts with no grungy oil to deal with afterwards. The recipe is also fairly straightforward with common ingredients – I made 5 batches with stuff I had on hand – making an impromptu baking project a pretty realistic endeavor. But it’s still not a real donut. This much is true. Into a large bowl, sift the flour, sugar, soda, baking powder, salt and nutmeg; make a well in the center and set aside. Whisk together oil, buttermilk, egg, vinegar, and vanilla in a smaller bowl; add to dry ingredients and mix into a smooth batter with a rubber spatula. Lightly grease a nonstick donut pan with cooking spray; spoon/pipe a thin layer of batter into each mold. Spoon/pipe 1-2 Tablespoons jam in a ring taking care not to touch the pan sides. Spoon/pipe a thin layer of batter on top of the jam, filling the molds about ¾ full. Bake until golden and a toothpick comes out clean, 12-14 minutes. 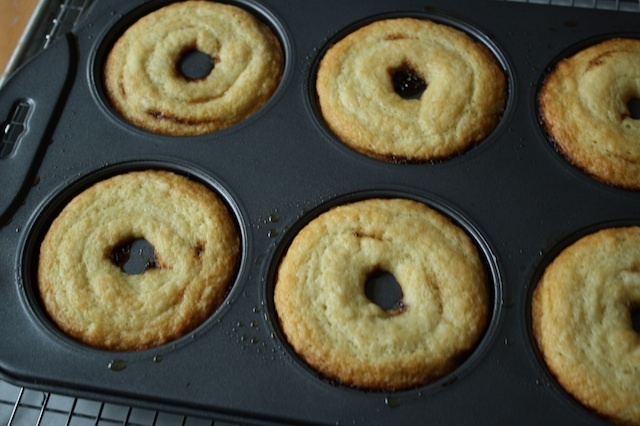 Invert donuts out of the mold onto a baking sheet with a wire rack; let cool completely. for the glaze: whisk together the powdered sugar, jam, salt and water until smooth. Dip the cooled donuts tops into the glaze, letting excess drip back into the bowl, then place back on the wire rack and allow the glaze to set, at least 1 hour. Donuts hold pretty well for a day or two if tightly wrapped. Glad to see you put your Christmas present to good use!